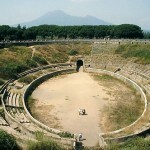 The Pompeii amphitheater is the earliest surviving stone amphitheater of the Roman world. 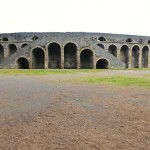 This ancient structure, built around 80-70 BC in the historic city of Pompeii, had provided the primary model for constructing the subsequent buildings. 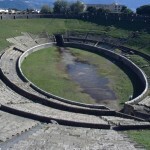 The historical landmark, besides offering fascinating insights into Roman amphitheater design now hosts various public events and concerts. 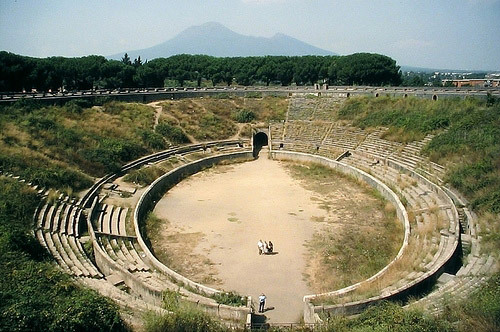 According to inscriptions, the amphitheater in Pompeii was constructed at private expense by two of Lucius Cornelius Sulla’s commanders – Marcius Porcius and Quinctius Valgus. 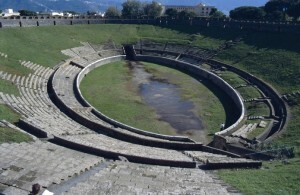 Instead of being referred to as an amphitheatrum, the term spectacula was initially used to describe the iconic structure. 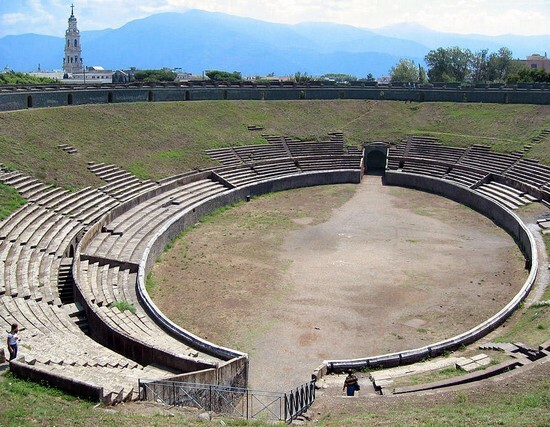 The preserved historic site, as well as graffiti, found throughout Pompeii gives us an insight into the gladiatorial games that were extremely popular in Rome. 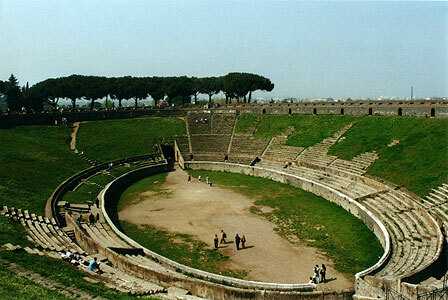 The amphitheater was the most important structure of that era with a seating capacity of about 20,000. 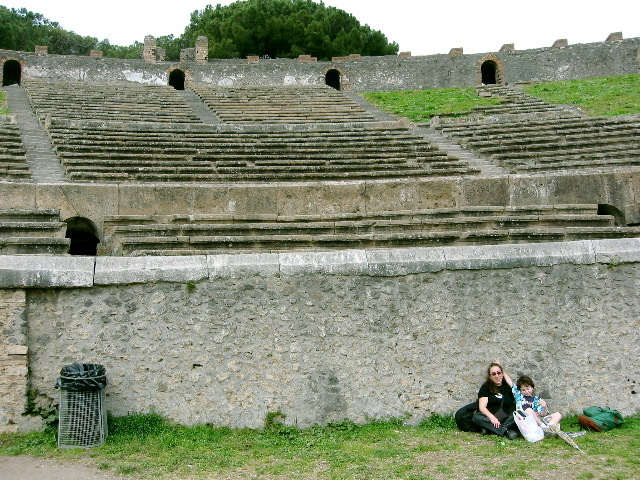 Spectators from not just Pompeii but also from the surrounding towns came to watch the games. 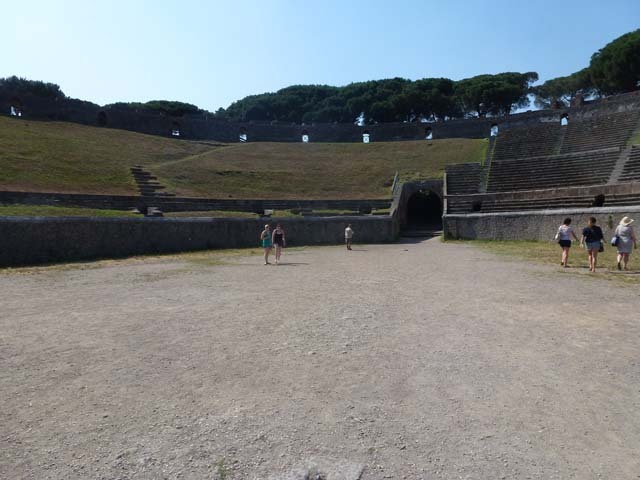 However, a 10-year ban on gladiatorial contests was imposed following a brawl amongst the Pompeian audience and people of Nuceria in the amphitheater in 59 AD. 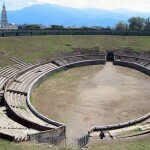 Despite the ban in place, the amphitheater was one of the first buildings restored after the earthquake of 62 AD. 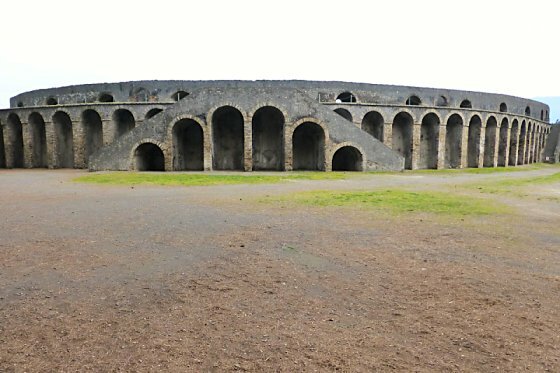 While it survived the deadly eruption of Mount Vesuvius in 79 AD, most of the structure remained buried under volcanic debris. 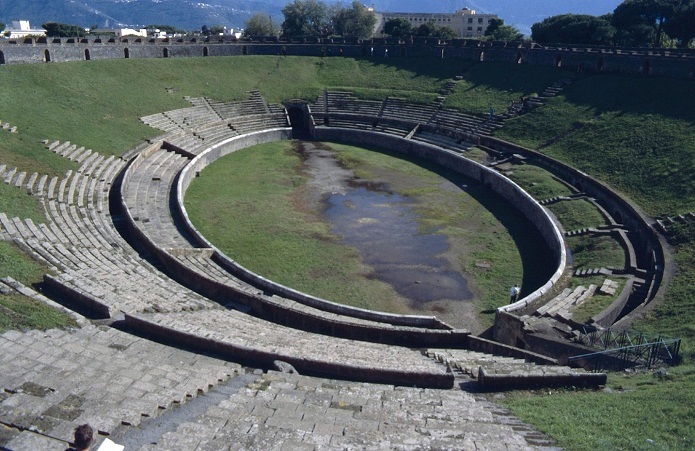 It was initially revealed in 1823 when the overlying material was cleared by Michele Arditi and Antonio Bonnucci. 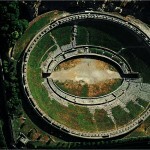 However, the site was systematically excavated in the twentieth century by the famous Italian archeologist Amedeo Maiuri. 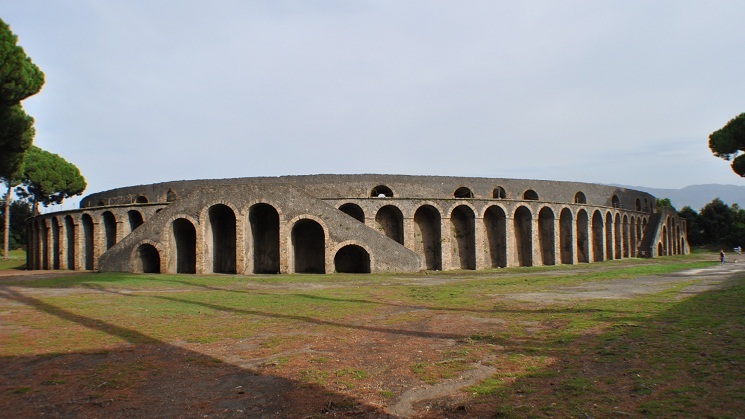 Amphitheater of Pompeii has a very simple structural design as compared to some of the later Roman amphitheaters. 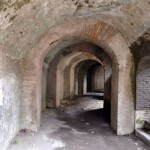 A ditch was dug out 6 m below the ground level and the soil was piled up into embankments. 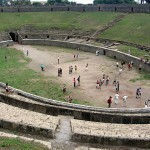 The ditch was used as the arena while the embankments served as the seating area. A 2m balustrade divided the spectators from the performance or event on display. 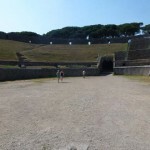 The arena had room for all the social classes with three distinct groupings including the summa cavea, media, and ima that were kept for the slaves or the lowest classes, the general populace, and the nobility or the higher classes respectively. 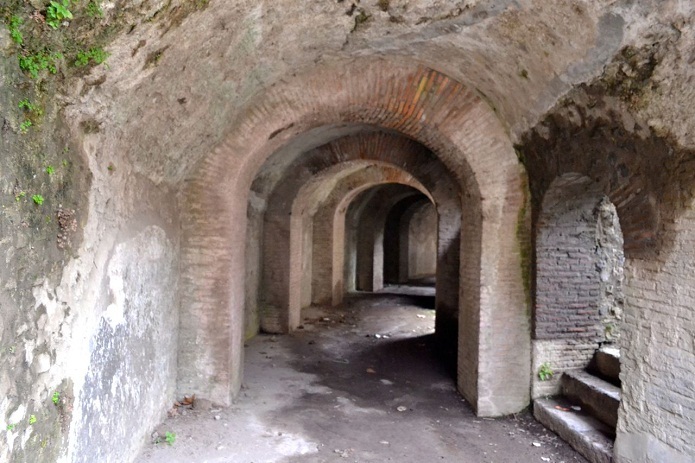 Instead of using the external stairways, the city’s elite class entered the amphitheater via the internal corridor that could be accessed using a covered walkway. 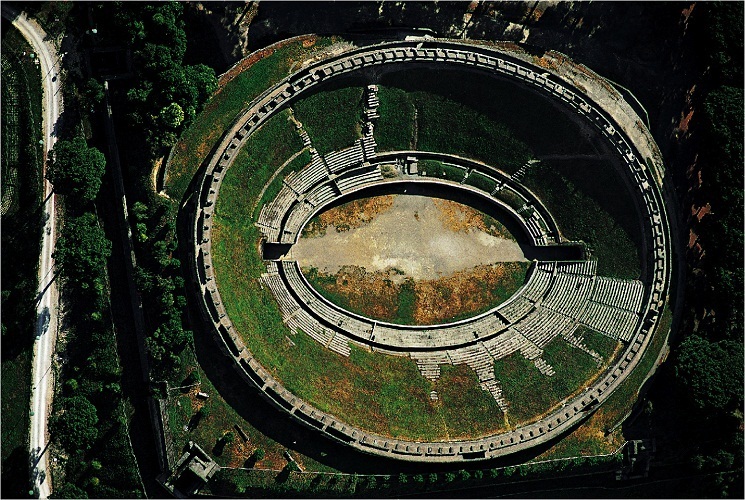 The eastern and southern sides of the amphitheater were bounded by the city walls. 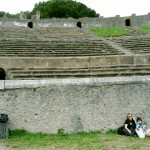 External staircases, initially constructed of wood, led to the seating places. 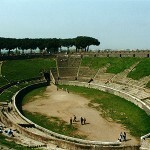 The arena could be accessed via two entrances – the Porta Triumphalis used by the gladiators and Porta Libitinensis used as the way out for the dead. 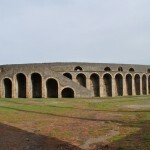 The amphitheater design was improved in 62 AD with the construction of new seating areas and the addition of brick buttresses for supporting the access tunnels. 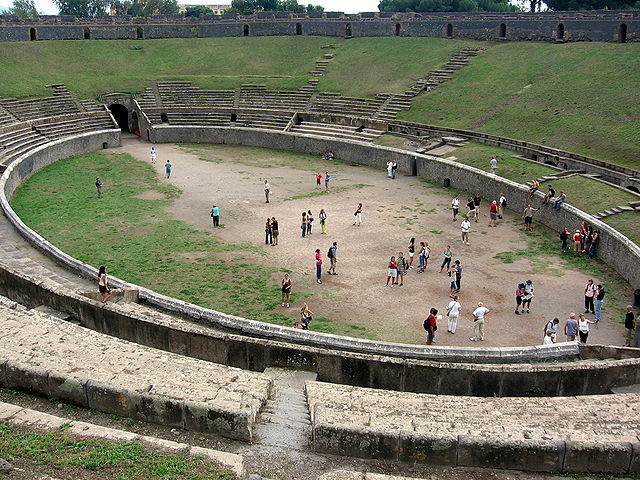 The arena’s balustrades exhibited brightly colored panels representing gladiator fights.